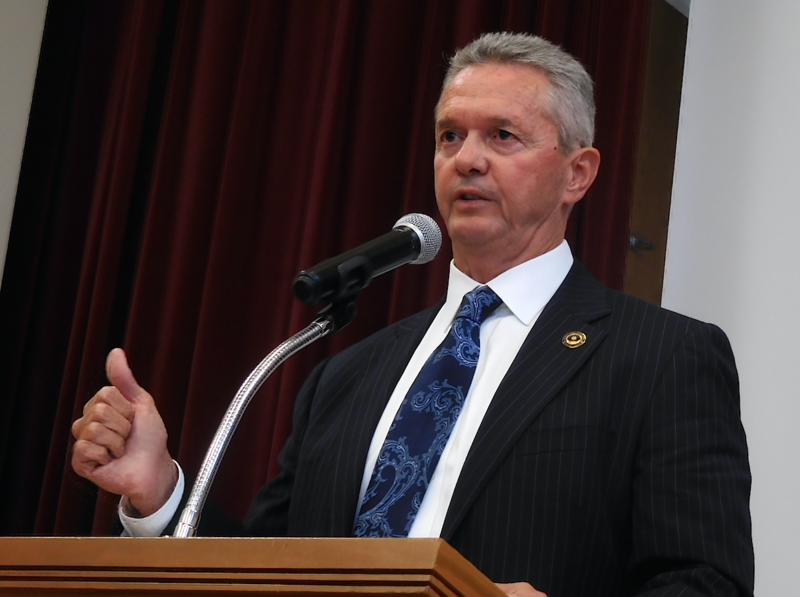 Alameda County Sheriff Gregory Ahern defended his policies before a gathering of faith leaders on Thursday. They began the meeting with a rousing chorus, singing in unison, “Lord prepare me to be a sanctuary.” Then, dozens of faith leaders from churches, mosques, and other places of worship grilled Alameda County Sheriff Gregory Ahern — for two hours — about his policies regarding immigration, homelessness, social services, and the controversial Urban Shield training exercise. But Ahern stood his ground and, frankly, clarified his positions, even saying several times that he was offended by the way local law enforcement has been characterized when it comes to hot-button issues. The unusual, debate-like forum, held yesterday inside’ Oakland’s Mormon Temple, was put on by the Interfaith Council of Alameda County and drew about 100 attendees. Ahern’s policies regarding cooperation with federal immigration-enforcement agents drew the most criticism. Although he’s adamant that his deputies do not enforce federal immigration laws, ICE frequently requests information from the sheriff, including the exact release times of inmates, so that deportation officers can intercept a person and arrest them before they actually leave the Santa Rita Jail facility in Dublin. “I’m an immigrant,” Father Aidan McAleenan, of Oakland’s St. Columba Catholic Church, told the sheriff during the forum. McAleenan said that his own experiences have shaped his views on the need to protect non-citizens from what he and many believe are unjust federal policies. McAleenan said that he came to the United States as a young man from Ireland on a work visa during his home country’s notorious and bloody Troubles. He said that he couldn’t go back to his homeland because Ireland was “war torn.” At the time, Catholic men were at risk of being killed in the conflict with pro-British Protestants. McAleenan drew a direct parallel between his experience and that of hundreds of thousands of Mexican and Central American immigrants, who have fled violence in their own nations to come to America, seeking asylum and opportunity. 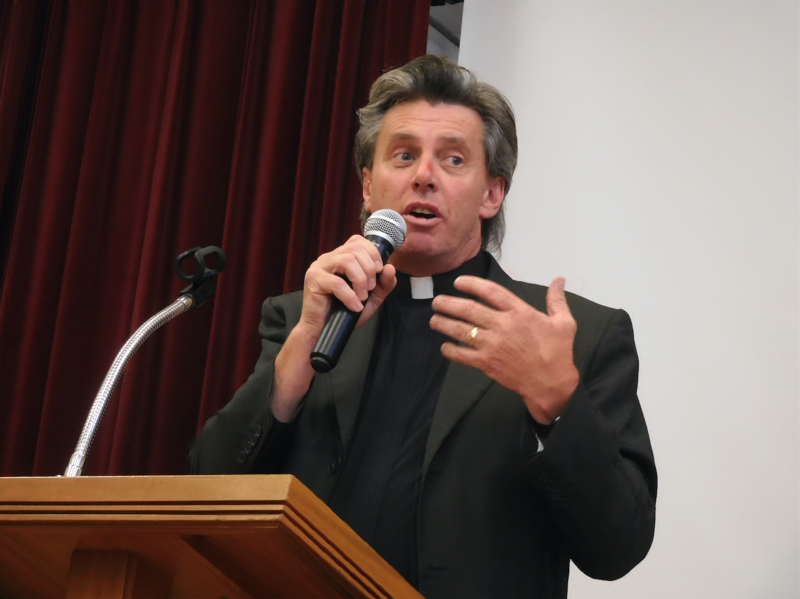 Father Aidan McAleenan, of Oakland’s St. Columba Catholic Church. The Rev. Deborah Lee of the Interfaith Movement for Human Integrity said that Ahern’s degree of cooperation with ICE goes above and beyond what he’s legally required to do, and that it undermines trust in law enforcement within Alameda County’s vast immigrant communities. “Notification is a form of collaboration,” Lee said, referring to the sheriff’s practice of letting federal deportation officers know when certain non-citizens are being released from custody so they can immediately re-arrest them. Lee said she was aware of at least 78 people who were released from Alameda County jail this year, only to be immediately re-arrested by ICE and locked up in the Contra Costa Sheriff’s West County Detention Center, which houses federal immigration detainees under contract with the Department of Homeland Security. The sheriff said that ICE has not accessed Santa Rita Jail to interview anyone since the TRUTH Act went into effect in January of this year. The TRUTH Act requires the sheriff to provide an inmate with written notice that ICE is requesting an interview, and that the interview is voluntary. But Ahern acknowledged that ICE agents come to the Santa Rita Jail in order to arrest people immediately after his agency releases them. Ahern pointed to a March 31, 2016, email he received from the U.S. Department of Justice, warning him that his agency could lose federal funding if he were to adopt any sanctuary policies that prevent his deputies from sharing information about a person’s immigration status with ICE. “So, we allow [ICE] into our facility,” Ahern explained. In years past, ICE took approximately 1,000 people into custody annually from Alameda County jails, said Ahern. But he said the number has steadily been falling, and that, this year, only 126 people have been arrested by ICE at the Santa Rita Jail. Screenshot from Strategic Operations, Inc.'s website. The sheriff was also questioned about the controversial Urban Shield training exercises that his office coordinates each year, in which dozens of law-enforcement agencies gather in the Bay Area to conduct SWAT team exercises, but also to learn emergency-response techniques in case of disasters such as fires and earthquakes. Rev. Michael Yoshii of the Buena Vista United Methodist Church of Alameda said that Urban Shield is geared too much toward a militarized style of responding to potential threats to the community, and that there should be more resources set aside for proactive solutions to the crises of housing, hunger, and natural disasters. Yoshii asked Ahern if he would commit to allowing a community board to observe all of the SWAT team exercises and review the event’s vendors to address concerns that it’s too militarized. Rev. Michael Yoshii of the Buena Vista United Methodist Church of Alameda. As an example of Urban Shield’s problems, Yoshii pointed out that a $45,964 contract to purchase “hyper-realistic training services” from a vendor called Strategic Operations Inc., as part of the upcoming Urban Shield, was canceled by the board of supervisors two weeks ago. According to the supervisors, the request violated a county policy that none of Urban Shield’s vendors would sell, display, or otherwise promote derogatory and racist imagery or messages. 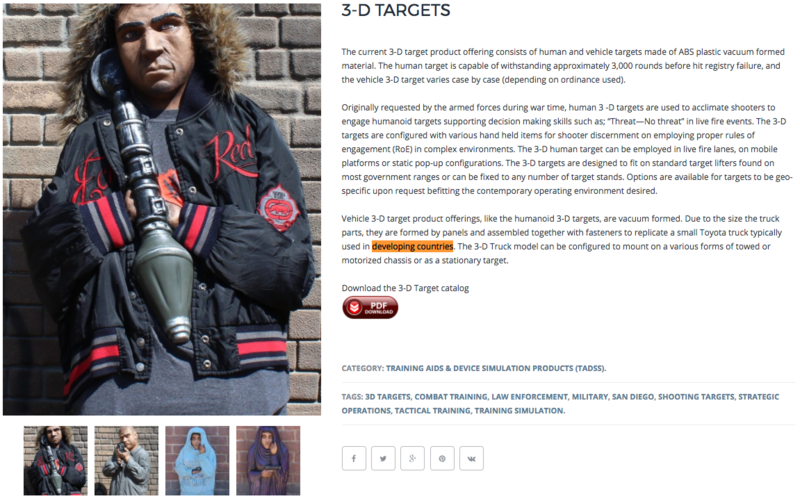 Also among the targets available is a woman wearing a burka. The contract was initially brought to the supervisors’ attention by Tracy Rosenberg of the Media Alliance and Oakland Privacy, two groups that monitor law enforcement. Supervisor Keith Carson called the vendor’s website “disturbing,” and Supervisor Richard Valle said it violated the policy regarding Urban Shield vendors. As a result, the board rejected the proposed contract. But at yesterday's forum, Ahern defended Urban Shield. He said his deputies and other law-enforcement agencies will have to respond to disasters, and possibly also terrorist attacks, including active-shooter situations, and that it’s important they be prepared. “Urban Shield saves lives,” he said. 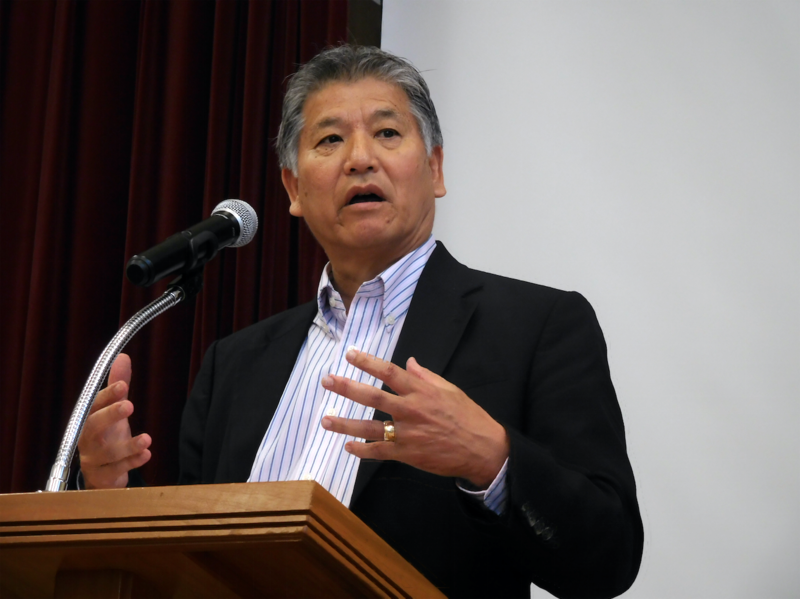 Yoshii asked if Ahern would allow faith leaders and other community groups to more actively monitor the Urban Shield exercises. The forum ended, however, without the sheriff and faith leaders coming to agreement on any issues — except, however, a commitment to keep talking.